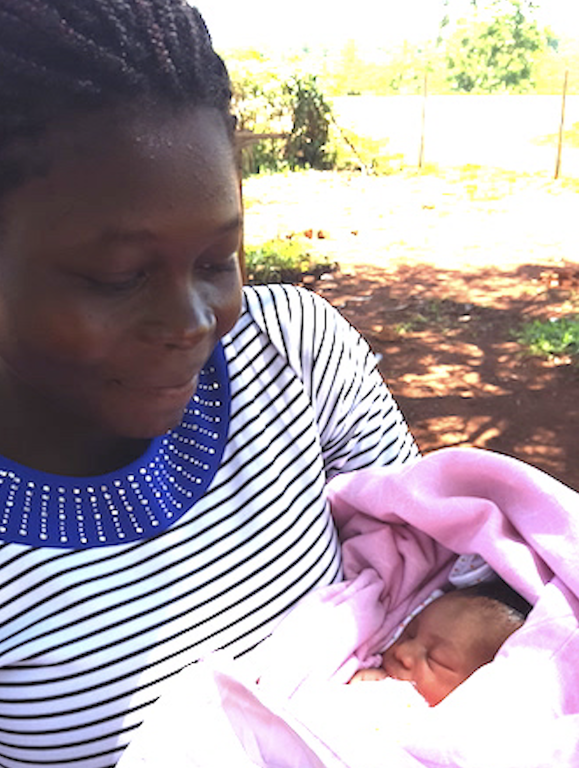 Fostine was 20 years old and pregnant with her first child when she arrived at the clinic at 2 pm in the afternoon. For the first few hours it was incredible to believe she was in labour as she preferred to sit outside with her sister in law rather than lie in a bed in the clinic. As the contractions increased at around 5pm she came into the maternity unit. Her waters still hadn’t broken but her contractions were coming regularly and increasing in strength. Amazingly she didn’t make a sound during her entire labour despite having no pain relief. The second stage of labour became very long and protracted and the baby was monitored constantly by Rachel the midwife using the foetal heart monitor. It was a difficult birth with the baby becoming more distressed and being born with the cord firmly around her neck. There were some very scary moments as the baby didn’t make a sound but after help from the midwife she opened her little lungs and cried. The baby weighed a healthy 3.1kg and recovered well much to everyone’s relief. Our Trustees Jackie and Jo, who were visiting the clinic, felt very privileged to be present at the birth of this baby girl in the new maternity unit on the day they arrived. Mum was so thrilled with her new baby that she decided to name her Joanna Jackie after the Trustees. She fed her and leapt off the delivery couch, had a shower and within 30 minutes of giving birth she had left the unit and jumped on the back of a motorbike with her sister-in -law holding the baby! Fostine returned the next day looking amazing, having walked for an hour with baby so that she could be given her first BCG vaccination. Jackie and Jo were quite overwhelmed by such a beautiful experience and it really brought home to everyone the vital need for this maternity unit and having midwives available to assist women at the time of delivery. If Fostine had been trying to give birth at home with no support it may not have been such a happy occasion. Thank you to all our supporters for helping to provide this essential facility and staff to run it.